As I mentioned in the entry on Annan River Gorge, I have kind of a thing for waterfalls. But I think most people do. There is something both elegant and powerful about water gushing over a drop of whatever depth, from short rushes to long, sinuous falls. So, with time in Queensland drawing to a close, and a move to a drier region (and who could guess how I’d react to that) just ahead, visiting waterfalls on the Atherton Tablelands seemed irresistable. 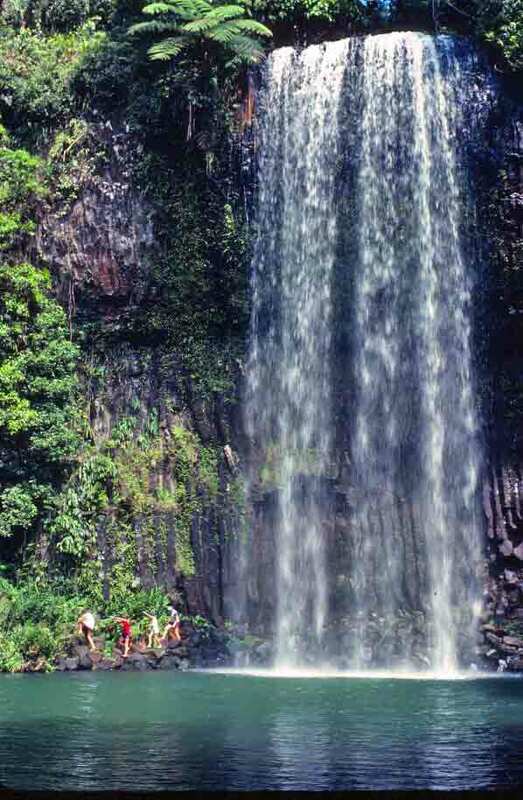 The Atherton Tablelands are carved by numerous streams and rivers, and waterfalls abound. Most of the falls are surrounded by the glorious greenness of the rain forest. Visiting the area’s falls was the perfect way to say farewell to greenery. Of the falls I visited, my favorite was Millaa Millaa Falls. All were lovely, but Millaa Millaa was tall enough to be impressive, in an open area that took full advantage of the delightful interaction of sunlight and water. Unlike neighboring New Zealand, Australia is well away from the “Ring of Fire,” but that wasn’t always the case; the east coast of Australia was at one time one of the world’s most extensive volcanic zones. However, there hasn’t been any volcanic activity there in about 5,000 years. Australia’s volcanoes are dormant (though not extinct), and there are craters and reminders of this distant past all over the continent. 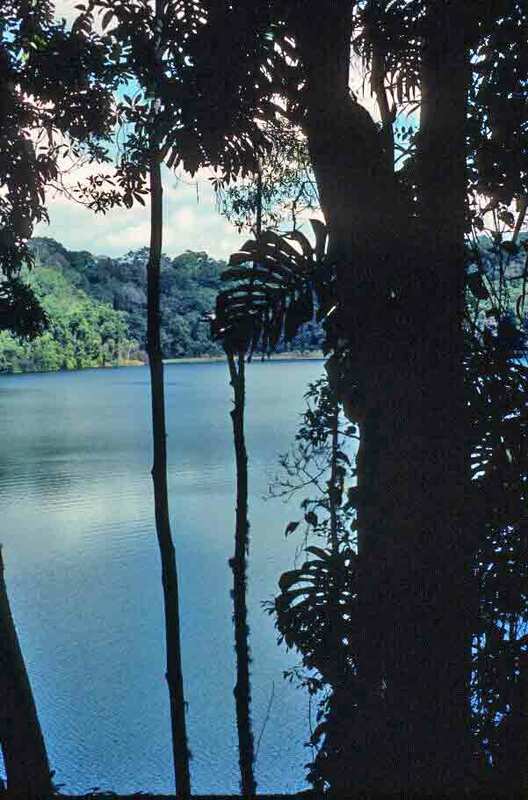 In the wet, tropical north, the craters have filled up with water, creating incredibly beautiful, steep-sided lakes with rich plant and animal life. One of the crater lakes I visited outside Cairns was Lake Barrine, a lake of such clarity that I could easily see the fish, turtles, and freshwater eels beneath our boat. With birds, butterflies, lush greenery, and exotic flowers on all hands, I was in heaven. Almost as soon as the Barron Gorge Railway (the line that connects Cairns to Kuranda) opened at the end of the 1800s, it became a hugely popular tourist attraction. 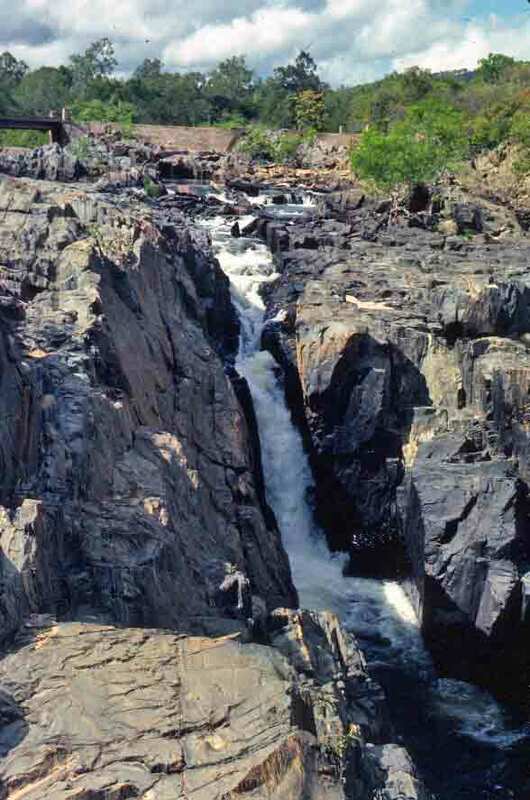 Passengers from ships that docked in Cairns would take the ride up the gorge to see the picturesque falls, admire the tunnels and trestles that permitted the passage of the train (a great engineering accomplishment), and enjoy the beauty of the tablelands. I had already enjoyed a little of the beauty of the tablelands by the time I headed for the train station. The Kuranada Station is almost as famed as the ride down the mountain. Ornamental plantings for the station were first proposed in 1910, and the station masters at Kuranada won their first Annual Garden Competition in 1915. They took that honor often after that. 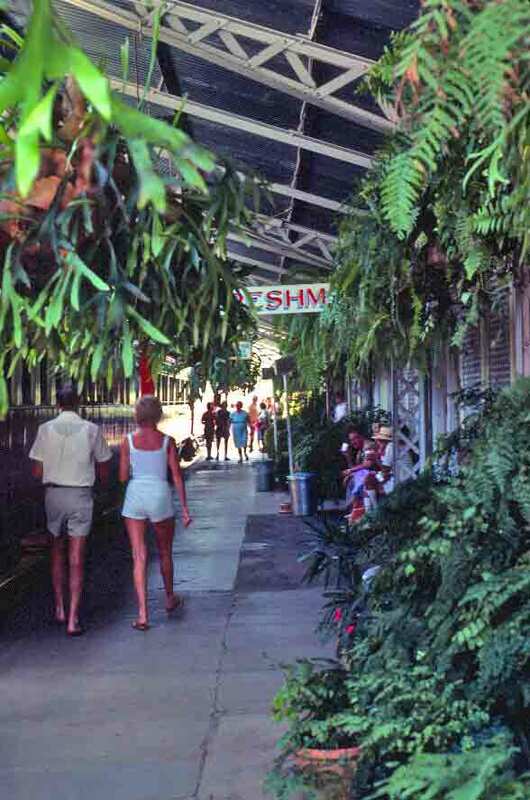 The abundant flora at the station has been maintained from those first ambitious days of planting, and it makes the station seem more of a destination than a jumping-off point. Like the river in Scotland, the Annan River in Queensland is a destination for fishing enthusiasts. Unlike the river in Scotland, however, the Annan in Queensland has crocodiles, at least in the broad, salty estuaries near the ocean. You need to find out how far inland you are before you think about swimming in this river. We were far enough inland that crocodiles were not a concern for us. We stopped to view the Annan River Gorge, a deep cleft cut by the river through a rocky wilderness that in turn seem to cut through the surrounding woodlands. I have a special fondness for waterfalls, so I wanted to photograph the rushing river dropping into the deep gorge. However, there was no position where I could get a clear, unobstructed shot—so I got a couple of the guys in our group to hold onto my belt while I leaned out over the gorge to get this shot. In retrospect, I think I was crazy. But I like the shot, and it seemed like a good idea at the time. Australia has many pubs, and the pubs that are in rural areas—the bush or outback—are more likely than their urban counterparts to offer overnight accommodations. After all, drovers (Aussie cowboys), miners, merchants, mailmen, and other travelers on the long, dusty tracks needed places to stay as they crossed the wide land. During our drive down the Queensland coast, from Cooktown back to Cairns, we stopped to see one of the older pubs of this region, the Lions Den Hotel. Its construction is pretty much what one comes to expect of historic outback pubs—wood beams, corrugated metal roof, broad veranda. I immediately loved the look, and delighted in these rustic pubs wherever I saw them across Australia—and even made special trips to some of the more famous ones (such as the great old pub in Birdsville—but that was on a different trip). 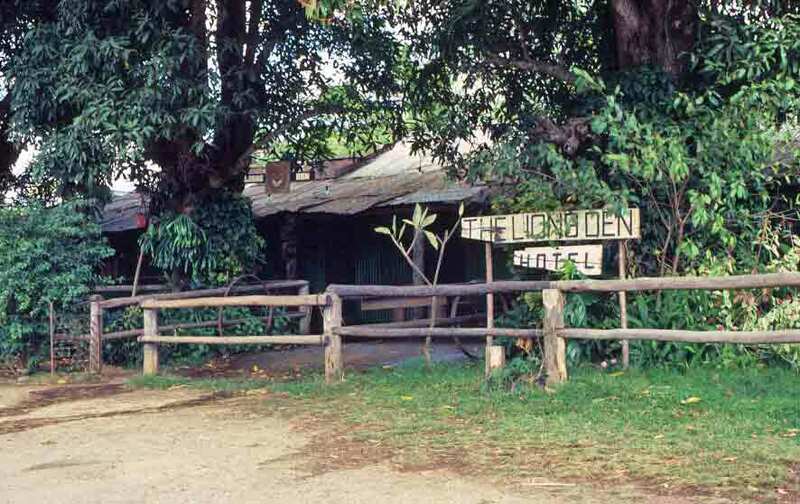 Here’s a shot of the Lions Den Hotel south of Cooktown. But here are a few cool facts for you. • A piece of wood that some people believe came from James Cook’s first ship, the Endeavour, was carried into space aboard the space shuttle Endeavour. • The reports and drawings from Cook’s voyages are so detailed that native peoples in some of the places he visited are using the materials to learn about their ancestors, culture, and history. • Cook had to work hard to get ahead, because his parents were poor. In his day, it was assumed that being poor meant you didn’t have much in the way of brains, talent, or courage. Cook proved them wrong. • One of the several sciences Cook mastered was the then-new science of surveying. In spite of the fact that the science was new, Cook immediately recognized its potential usefulness. Cook’s survey of the St. Lawrence River helped General Wolfe land safely at Quebec, where he won Canada for Britain. • As skilled as Cook was as a surveyor, it was his scientific papers on the sun and planets that brought him to the attention of the scientists who would send him on his first great voyage to the South Pacific—to observe the transit of Venus. It was after observing this phenomenon that Cook went on to survey New Zealand and the east coast of Australia. Vastly more could be said, but I’ll stop there. In the book, I mention how rough the road is from Cooktown to Cairns. I would learn, later in this trip and during subsequent trips, that there were roads that were worse, from wildly rugged to barely discernible, but this first track was still impressively rough. Yet the roughness was part of what appealed to me. The sense of remoteness was one of the things that made this all seem impossibly romantic. Of course, it didn’t hurt that we were surrounded by exotic flowers, beautiful parrots, and scenery that ranged from lush to dramatically barren. 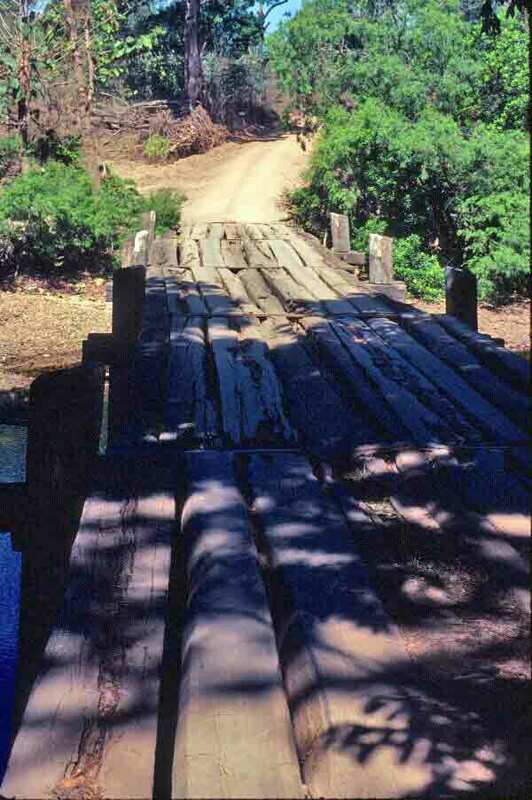 Here’s a photo of a bridge we encountered near Cooktown. I think it hints at the wonderful ruggedness of our drive down the Queensland coast.